The Princess Diaries begins with a tribute to Disney’s animated princesses, from Snow White to Mulan. Though this movie will probably not be remembered as one of Disney’s beloved classics, it was fun to watch. Pretty Woman, from the same director, also features a female character learning to be a lady (plus it features Hector Elizondo in the same role). The heroine is 15-year-old Mia Thermopolis (Anne Hathaway), who lives in an old firehouse in San Francisco with her artist mother. She is content to be the wallflower at school. When she does get noticed, it’s for running out on her debate speech with a nervous upset stomach as the popular kids laugh. Her life changes dramatically when she hears from her long-lost grandmother. Mia is stunned to learn that Grandma (Julie Andrews), is Queen Clarisse of Genovia, a small European country based on Liechtenstein or Luxembourg, no doubt. Mia’s absent father was to succeed to the throne but he died recently and now Mia is the only heir. Mia is reluctant to accept her title and the responsibilities that come with it. “My expectation in life is to be invisible and I’m good at it,” she tells Clarisse, though she does agree to participate in some official functions while her grandmother is in town. Can this klutzy, casual teenager be turned into a beautiful, poised young woman? In this kind of movie, the answer is yes. Clarisse and her bodyguard/chauffeur (Hector Elizondo) give Mia lessons in things every princess must know — sitting, walking, drinking tea and waving. She also gets a makeover to look the part, though she wasn’t unattractive to begin with. The Princess Diaries follows the familiar ugly duckling story. The lessons Mia learns about self-confidence and friendship are no surprise. This doesn’t make the movie any less entertaining. The movie has enough slapstick humor to please children in the audience without overdoing it. And though it has a few too many subplots, Diaries never strays too far from the main story. Hathaway brings plenty of energy and charm to her role, which requires both physical humor and teen angst. Julie Andrews lends credibility to the movie as Queen Clarisse. Her presence is both regal and human. 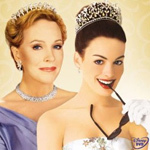 Since there are so few G-rated live action movies intended for girls, I was predisposed to liking The Princess Diaries. Despite its predictability, I wasn’t disappointed. It’s a movie kids and anyone else who got dragged along will enjoy.